Time to test your Mathematical skills. 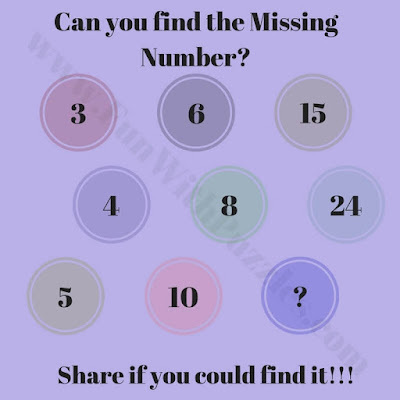 Here in this missing number picture puzzle, there are some numbers given in Circles. These numbers are related to each other. Your challenge is find this relationship among these numbers and then find the missing number which will replace the question mark in Circle. Can you solve this missing number puzzle as quickly as possible? Answer of this "Find the Missing Number in Circle Puzzle", can be viewed by clicking on button. Please do give your best try before looking at the answer. The Answer is 33. These numbers are related to each other vertically with arithmetic progression. It means difference of two numbers going vertically is same.